Kojiki or Furukotofumi (古事記), also called in English the Records of Ancient Matters, is the oldest book known in Japan. It was written 712 CE. The Kojiki is a book filled with Japanese mythology and religion, Shinto. The book mixes the legends of the first emperor of Japan and several others with stories about the gods. Therefore, it is difficult to know which parts of the Kojiki are real and which parts are legend. In the legend, all the emperors of the Japan are descended from Amaterasu, the sun goddess. The Kojiki is divided into three parts: the Kamitsumaki (上巻, "first volume"? ), the Nakatsumaki (中巻?, "middle volume") and the Shimotsumaki (下巻?, "lower volume"). 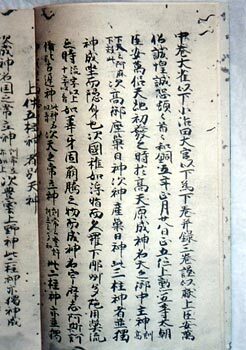 The Kamitsumaki, also known as the Kamiyo no Maki (神代巻?, "Volume of the Age of the Gods"), includes the preface of the Kojiki. It is about the first gods in the mythology of Japan, Izanagi and Izanami. These are the gods who created the world. This volume also tells of the births of various gods of the kamiyo period, or Age of the Gods. The Kamitsumaki also describes the legends about the creation of Japan. It describes how Ninigi-no-Mikoto, grandson of Amaterasu, came down from heaven to Kyūshū and became the ancestor of the Japanese royal line. According to this legend, he is considered the great-grandfather of Emperor Jimmu. ↑ "Kojiki". Encyclopedia of Japan. (2012). Tokyo: Shogakukan. Retrieved on 18 September 2012. ↑ "古事記". Nihon Kokugo Daijiten. (2012). Tokyo: Shogakukan. Retrieved on 18 September 2012. ↑ "Ninigi no Mikoto". Encyclopedia of Japan. (2012). Tokyo: Shogakukan. Retrieved on 18 September 2012. This page was last changed on 30 June 2013, at 11:12.